In the cozy town of Pine River there is a holiday tradition in which a special Christmas tree is decorated in the town and no one seems to know who is responsible for it. But what is more amazing is the gift that the tree brings each season. Over the course of decades it has been that anyone can write down their wish and hang it on the tree and the legend is that everyone’s wish has always come true. It has been an opportunity for the community to come together to look out for one another. One thing that the book makes evident, is that there are plenty of people who have some mis-fortune. The four youngster of the story seem to live in poverty in this town that appears to need the Angel Tree. There is certainly something very nice and touching about the idea of the tree. Most churches I’ve been in around the holidays have something very similar…pick a name off the tree and try to buy what the family in need have listed on their tree tag. But the idea of the community coming together to support those in need is clearly a community that most would want to belong to. What I didn’t care for in this story, however, was the idea that the secret benefactor would be uncovered. Other than curiosity on the part of the kids, there wasn’t any reason for it. When someone chooses to do something anonymously, we should honor that desire, not try to make that person public. That basic premise of uncovering the identity of someone doing something good but wishing to remain unknown, leaves a sore mark for me. As a book for children, this would suggest that we can intrude on someone’s privacy if we want to do something ‘good’ for them. I’m not sure I would agree with that. Looking for a good book? 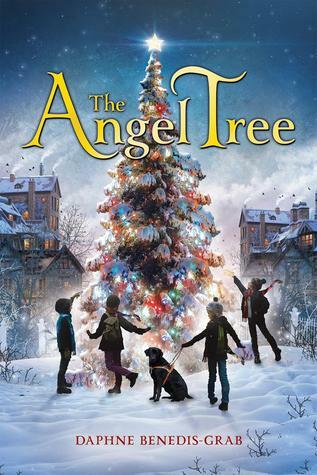 The Angel Tree is a nice idea, in a cozy little town, but answers a question that wasn’t looking to be answered. 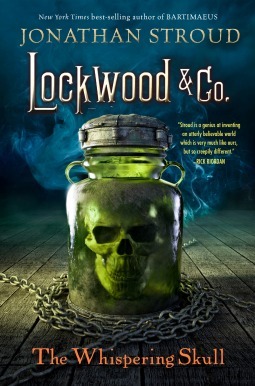 I’m not sure where I got this book … it doesn’t appear to have come from NetGalley or Edelweiss (two organizations from whom I receive Advance Readers Copies of books) … but I’m very glad that I got it and read it because it was really delightful. There is a quality about the boy that reminds me of the best of Edgar Rice Burroughs, in which a human has to come to terms with being among an alien race and taking decisive action, yet still not necessarily being a victor in all combat. The art in this comic book (and this is a single issue of a book and not a complete graphic novel) is fabulous. It, too, harkens back to a an earlier era of books… of comic books that were drawn with care and talent and not thrown-together-sketch art as I’ve seen too often in books lately. Look at the cover as presented above. Each panel of art manages to capture this same look and feel. I should also point out that the publisher has understood the value of the two-page spread and for each two-page spread, has put both pages on the viewing screen (for the digital edition, of course). There is still some need on the part of the reader to adapt in order to read the page(s), but it allows for better viewing of the artwork and better understanding of how the pages should be read. Kudos to Noise Trade! The story of Erik Farrell waking up, lost and alone, the only living boy on the planet, is exciting and captivating. The art is glorious. This is a book that I want to keep reading! Looking for a good book? 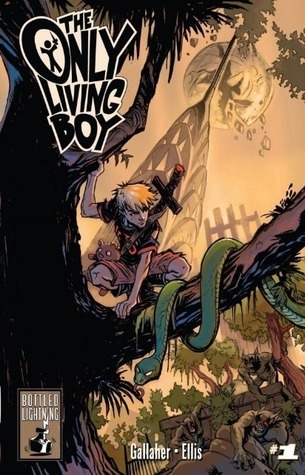 The Only Living Boy #1 is an excellent comic that deserves to be purchased and read by lovers of the genre and may bring in new comic book readers. The first book, Game, started off quite well, but Buzz didn’t meet with expectations or even pave the way for the final book. Bubble follows Henrik “HP” Petterson, living off-the-grid, as he works with a group of former Game players to seek out the Game Master and bring an end to the Game, while HP’s sister, Rebecca Normen works her way back into a security force which is charged with protecting a Swedish princess at her up-coming wedding. Although author de la Motte tries to continue misleading the readers with some red herrings as to the Game Master’s true identity, it comes across a little heavy-handed. So much so, that it was clear, very early, that it most-likely wouldn’t be the person de la Motte was presenting. One problem I’ve had with the entire trilogy is the relationship between HP and Rebecca. It’s completely acceptable to have a brother and sister with a dysfunctional relationship, but this relationship is beyond dysfunctional. There seems to be no reason to have these characters related, other than an attempt to create a little more conflict, specifically with Rebecca. This attempt is forced and never feels believable. I can buy into the idea that they aren’t close, but at the same time we have to accept that they are close enough to look out for each other. De la Motte switches points of view between Rebecca and HP quite a bit. We can presume that the stories will intersect, and yet despite this switching back and forth and the fact that they are siblings, they have no contact with one another through the bulk of the book. Playing a bigger role in this book are some of the secondary characters from the first two books. I most definitely was interested in both Uncle Tage and HP’s friend, the enigmatic Mange. 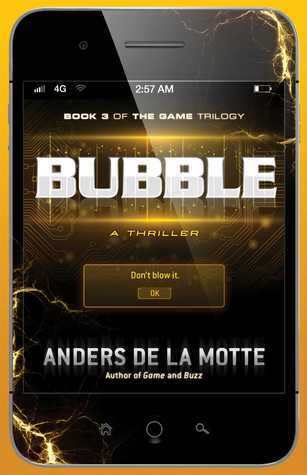 Neither Buzz, nor this novel, Bubble, manage to reach the excitement that de la Motte achieved with Game, though this one at least manages to have a strong focus, even if that focus is generally split between the two main characters. There is a lot of set-up to the final scene, and sometimes the action drags a bit, as though there wasn’t quite enough material to fill a third novel and it was padded just a bit. Overall, not a bad read, but it still doesn’t reach the level of intrigue built in the Game. Looking for a good book? Bubble ends The Game trilogy and has a few surprises, but it doesn’t quite live up to the first book. I really like bathroom-reader type books, and that’s what this is. Miscellaneous information given in short, easy to read snapshots. 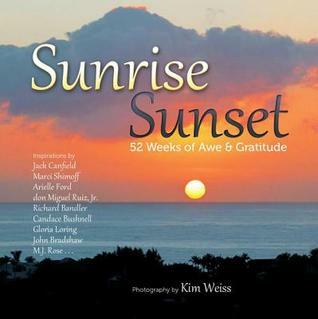 Young Mr. McBride and Mr. Nief made two mistakes with this book… first, not all of these seventy-four articles are obscure (as the title says), and second, these are not “forgotten” — at least not to some of us who remember many of these. But other than what I might consider a tad bit of a misleading title, this book is a wonderful glimpse at pop culture and history. While not everything here is forgotten or obscure, they certainly run the risk of being so, and McBride and Nief do well to remind us of these gems from our past. The factual aspects appear well researched, but the attempts to be ‘cute’ or funny, particularly with the “Hypothetical Usage in a Sentence by the Old and Settled,” which ends each section fall short. The “Hypothetical Usage” doesn’t read as ‘real’ nor as funny and I would have been fine without it. Looking for a good book? 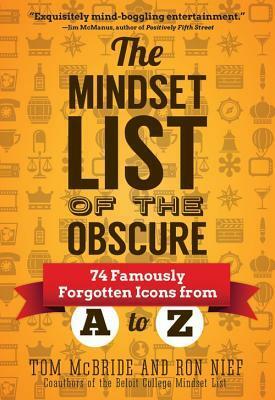 The Mindset List of the Obscure is good bathroom reading and a nice way to stay current with the past. In the mid-1970’s if I ever thought of cartoons, one name came to mind…Gahan Wilson. His wit was wicked and his drawings deliciously simple but a tad off-beat. This brought back fond memories as I read through it, undoubtedly for the first time since I bought it in 1975. Looking for a good book? 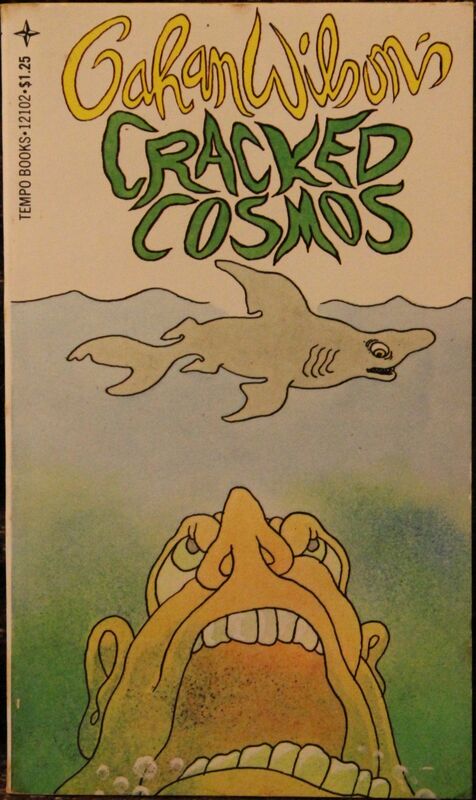 If you can find a copy of Gahan Wilson’s Cracked Cosmos, you are in for a treat.